Welcome to our new feature, Updates and Alerts! For any of you who have been unable to stay logged into your WordPress account, please click HERE for a possible solution. This tech document can also be found in the Page “Answers to Techie Questions” in the Menu area (click the “Menu” button in the upper right corner of this web page for this material). We’re pleased to let people know that we may have figured out a tech fix that could enable those of you who have been having difficulty staying logged into their WordPress account from one day to the next to stay logged in after all. Our thanks to Doug for putting us onto the right path (we hope) for solving this issue. This is a tentative fix, and it may help some but not all of those of you who are having this problem. If you’re one of those having this problem, please give this fix a try and let us know in the Comments area below whether it helps you or not (link to the document is in “Updates and Alerts” above). BUT PLEASE NOTE: THIS FIX IS ONLY for those readers who are *not* able to stay logged into WordPress across many days. Anyone who *is* able to stay logged in for long periods of time does *not* need to apply this fix. For those of you who have problems logging back into WordPress after applying this fix, please click https://wordpress.com/log-in to go to their login page and log back in there. Then reload this page to see the black ribbon which should now appear. You won’t see the black ribbon unless and until you reload our website after logging into your WordPress account. It has also come to our attention that some of our readers may not realize that there is a fair amount of useful information in the “Menu” area. If you are not aware of this material, you can find it by clicking on the Menu button in the upper right corner of any web page on the site. We urge everyone to get familiar with that area. And that gets us to the new “Update and Alert” area we may periodically place at the top of a new or recent post in the future. (See the top of this post for an example.) We are hoping that this will help us get news and other material in front of everyone in a way readers won’t miss. Events are speeding up. We may want to alert everyone to topical news as it happens, rather than waiting to write it into a later post or have it be lost. As in this post, we may want to point every reader to new information we have placed in the Menu area. This also gives us the opportunity to provide other brief messages. Please take a look at the Alert at the top of this post to get familiar with its appearance and what it might contain. We will see whether this new section proves useful or not. Thanks Steve and all who helped! You guys are amazing. Well, Kristinreh, don’t call us amazing until we prove this fix works. So far, my own experience tonight is that it works pretty well for Firefox but not for Safari. I’ll retest things tomorrow. Joseph, I’ll try that if I find myself logged out tomorrow. However, when I copy the URL to my desktop, I get a webloc file and believe that will not retain cookie information. We’ll see – experimentation is good! Clicked on my A Sign of Hope, Abraham’s Journey desktop icon this a.m. and I’m logged in now. Will continue to check it out today and tomorrow. This drag and drop the green lock of the address bar to the desktop to produce an icon works well with my mail and any site to which I want to return. I have at my ready use several online Bible translation icons to which I can refer when I want to search for a verse of Scripture–all for free! Another handy use is to obtain pictures and images for my Pictures folder. However, before I drag the icon to the folder, I change the file name letters to .jpg. If anyone gets the idea I’m some sort of a commuter geek, these comments are from the guy who was, and still am, the original Dummy for whom the book, Computers For Dummies was written. I found this stuff by accident and sheer dummy luck! My computer is from the prehistoric era–True! So far, I’m getting logged in automatically as I should, but I have saved the webloc just in case, so I can test it as you have recommended. My process, drag and drop address bar of ASOH does not work, had to log on. Thanks for the info. Sorry to hear that, Joseph. It would have been a much easier fix for everyone if it could work. AScot, please keep an eye on it for a few more days. It wasn’t working for me this morning in Safari, so I went to Preferences and searched for every related site and deleted those cookies. When I came back here, I got logged in right away. It does appear to be cookie-or-cache-related. I use my iPad for all of this. I have attempted several times to stay logged in. It doesn’t seem to work and I have given up attempting to stay logged in. I followed the directions you posted to no avail. After several months of this I either log in or by clicking on the gray follow icon in the lower right hand corner it takes me to the reader. I access it through that. Not a big problem-small annoyance-oh, well. Thank you for all the work you have put into this matter. Thank you, SteveBC. Will check it out. When I went back to the site this afternoon it was working. Go Figure. I followed the instructions for MAC, and subsequently lost my ability to sign in either to WordPress or even into my own email account with gmail. You do not want to know the thought which were passing through my mind and a few or the rougher ones which even passed through my lips. [None of them qualified as grave sin – but venial – probably. Then with amazing assistance from my Guardian Angel [I think] I managed to fight my way back into cyber city [Taht’s not even remotely related to Augustine’s idea of ‘The City of God’. Now that my heart rate has slowed a bit – I am going up to get some breakfast – and to thank God I did not have a coronary infarction :-). Thank you, and don’t mind at all. I suspect that you used the “nuke everything” alternative, which would remove cookies for all your websites. I include this alternative because by removing all cookies the first time, it can clean out all corrupted cookies that may be adding to the problem. If you did use that alternative, then you would later need to log back into WordPress and Gmail and other sites, to reset their cookies. This is actually normal behavior when you remove all cookies. It isn’t *preventing* you from logging into Gmail but rather simply requiring you to log in again to set a new cookie for each site. At any rate I hope all is well now. If you try this fix again, I suggest you can now use the targeted alternative and just remove the cookie-related data for this website only. Today I improved the instructions in the Tech FAQ for this and provided an alternative that deals only with the cookie for this web site. Weeeehl, Steve, you see the problem was, both entities tried to force me to get signed back up through something I had to get on my email …I’m sure you instantly see why I got very excitapated and almost pixilated at that point. Yes??? Funny Des. I get frustrated over little things like missing an exit on the highway or a computer that does not behave. Whay can’t the computer do what I think? Where is the do what I think button? I have to say I have committed a few venal sins myself over this. Hi Steve- going to try to comment, but don’t know if the website will let me. I am one who has been having problems. I followed your instructions….I work from an IPhone 5….and now am unable to sign into WordPress at all. I tried to ‘like’ a comment and I am sent to a blank WordPress page with no prompts. I am shown as being logged out on ASOH site, but when I hit follow and give my email, it says I am already a follower, which, of course, I am. Frustrated. ☺️ But then, it is Passion Week. Yuh know, I gotta be some kind of slow. This kind of razzle dazzle happens to me every Lent, and every time I get take my surprise, slap my forehead and say, “Now I get it, now I remember what happens to me in Leant.! It’s also why I’m slowly developing a Cro-Magnon forehead which slopes backwards from so many head slaps during lent. Good word picture. That’s funny. SteveBC is our Geek Hero, indeed, CG. However strange the process is to make a comment, they ARE coming through. Know what? I wonder how many people are having difficulties like this. and start over. Try the ASoH website first. If you see the black ribbon across the tope of your webpage, then you’re actually already in. If you don’t see the black ribbon, then use the above link for the WP login page to get logged into WP. Once that works, go to the ASoH web site, and you should see the black ribbon this time. I am working at home today and watching Notre Dame Cathedral burn, I thought this might be a good place to share thoughts. I can’t help thinking that this is all a sign as it happens during Holy week, and the day of the Crisim Mass – at least in our diocese – the Mass which celebrates the sacrament and vocation of the priesthood. I can’t help but read into all this but I hesitate to prophesy without a license. How are you all feeling/thinking as you watch the events unfold in Paris? It’s very sad, MKM. I gather from my Twitter feed that churches and synagogues across France have been burned or desecrated over the past few months. I also saw a tweet saying that people who worked inside the Cathedral had reported that the fire was set. Not only would that be sad, but it could be destabilizing as well. Hmm….I have wondered about that Steve, especially with all the churches being harmed in France recently. officials have been quick to come out tonight and state no terrorist activity…no arson. Really? How could they know that already? It all seems to be a sign of the times…especially during Holy Week. We may never know the truth…but we can see the handwriting on the wall. Yes, we can, Diane. And like you, I see no possible way the “authorities” there could already know it was not arson. I doubt they are trustworthy on this. by the riverfront was blown off. The church had to be closed on Palm Sunday. I haven’t heard any news reports citing a cause, only that the cathedral was under a massive renovation. I pray it was not deliberate. Just home from tending to sick dear ones (Please pray, especially, for my daughter and, also, my three granddaughters.) and I have discovered the news about Notre Dame. Oh, Notre Dame. Such a magnificent cathedral! I have great memories of time spent praying within her walls and gazing upon this glorious edifice, richly blessed with artistic treasure. Prayers ascending for your family to get well quickly, B! Thank you, Maggie, for your prayers. This singing brought waves of chills. Beckita, I am praying for your family that they will all be well soon. So sorry to hear about this. Beckita, praying for you daughter and granddaughters, and you too. God bless you all. Yes, Beckita, adding my prayers. I hope things are better today. Oh, Beckita, praying for the healing and wellness of your loved ones, and for you , too. Never know if it is harder on us if we are sick or our loved ones. I am so saddened by the destruction of Notre Dame in Paris. A loss for the French and the whole world. I thought about the labor of love that many lives put into building that great edifice to the glory God and honor Mary. Over the centuries, humanity turned to admiring the work of its hands and ignored, and even rejected, the One to whom we owe praise and thanksgiving for such a gift. Things are falling. Took our eyes off Jesus. May our hearts be raised in prayerful repentance. Praying for the people of France. just saw photos of interior of Notre Dame with altar and cross intact. We may abandon God but He never abandons us. Alleluia! Thank you so much for your prayers, Judith. Praying for health for your “littles” and your “bigs”. 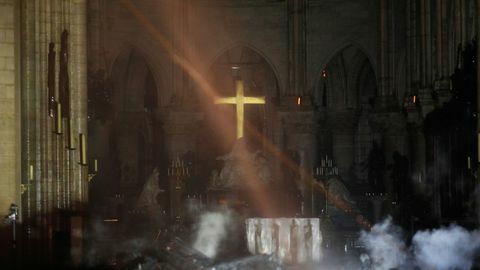 Reuters photographer Philippe Wojazer captured an image of the cross on the altar still standing and apparently emitting a golden glow above the 18th century pieta by Nicolas Coustou at the front of the cathedral’s nave. Smoke rises in front of the altar cross at Notre Dame Cathedral in Paris on April 15, after a fire engulfed the building. The image captures the cross and altar that survived the blaze. Update on prayer request. My daughter’s friend Ashley did die of a heroin OD. Apparently she recently started using and my daughter said she was isolating as my daughter fortunatly doesn’t use drugs. But pray for Jeanna, my daughter as she has had some conflicts with her cousins and I would like to see God heal this as well as for the repose of her friend. Thanks and God Bless. Praying for these intentions, Bob. I pray for the repose of your daughter’s friend Bob. I never log in. I just google Charliej373 and click on the link and it opens without problems ever. I do need to enter my email and name each time I Post however. I wonder if it is responding to an old login automatically? Bob, googling to get the link this way is a fine way to do it. You can also simply type “asignofhope3” into your browser’s locator field (where web addresses go) and your browser will autofill the rest. However, this will not log you into your WordPress account necessarily. If you are still having to enter your email and screen name in order to post a comment, you are *not* actually logged into your WordPress account. Only if you see a narrow black ribbon across the top of your browser page are you logged into your WordPress account. And if you were logged into your WP account and had the black ribbon showing, you would not need to enter your email and name in order to post – you would see your screen name already there next to the comment text field and could just enter your comment and hit the “Post Comment” button. It’s conceivable that you don’t even *have* a WordPress account, given what you’ve said. If you want one, click on the “Menu” button in the top right corner of this web page and go to the “Answers to Techie Questions” page to find information on how to set one up. And if you do have a personal WordPress account already, you can click the little blue “W” icon below any open comment field to get a login pop-up window or you can go to https://wordpress.com/log-in and enter your WP username and password, at which point you should reload the ASoH page and get the black ribbon across the top. I hope this helps! Thank you for your diligence in taking care of us, Steve BC. Earlier when Bekita called you our Hero Geek, I misread ‘Greek’ for “Geek” and pictured you in a toga with the complimentary wreath on your head. Hmmmm…. will you have a squirrel icon on your superhero cape? NextCan You Hear Me Now?